A: Don’t do it! Chef Biju says this won’t work; the thawed rice cakes have an unpleasant consistency. If you happen to have a vacuum sealer, you’re in luck, as they will seal up nicely. 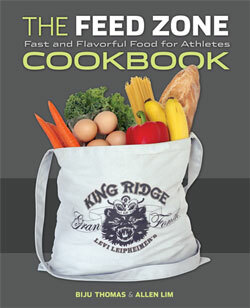 There are many portable recipes in The Feed Zone Cookbook that do freeze well, though. Biju says that any of the muffins and “most of the portables that are brown and not white colored” will hold up well in the freezer. Here are some alternative approaches to the rice inventory problem. Grain Silo: Make a bunch of rice for the week. Put it in a covered container and let it cool. Refrigerate it and pull out the amount of rice you need for whatever you’re making that day. Rice Just-in-Time Inventory: Most Feed Zone recipes use nice, round numbers for the ingredient amounts. Simply cut them in half to suit your portion needs. This will require making rice more often, but with a $15-20 rice cooker, it’s extremely easy. Just add the rice, the water, push a button and walk away. Repurpose that Rice! A reader just commented on this post with a great idea. 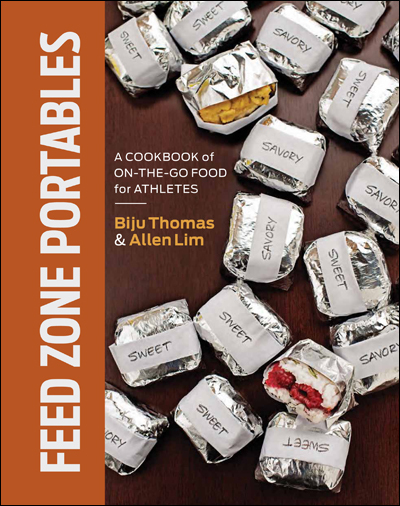 If you make the rice cakes and don’t eat them all, you can break them up and use the rice for another Feed Zone recipe, like Chicken-Fried Rice or another savory rice dish. ← Welcome to the Feed Zone! I have come across the same issue and reheated the rice cakes by breaking them up in a skillet fried rice style. I added parsley to make it more of a lunch/dinner dish and put it on a bed of spinach for a really good meal! Hey, that’s a good idea, too! Make the rice cakes and if you don’t happen to eat them, repurpose them! Thanks for the idea. Uh oh, I just made a batch of these this weekend, individually wrapped them, and placed them in the freezer. Bummer. I think I’ll still give them a try or re purpose them; I don’t like wasting food. I actually had no problem freezing my rice cakes. I prepared, pre wrapped, and placed them in an airtight container in the freezer. Before I head out for a ride, I take one out of the freezer, throw it in my back pocket, and by the time I’m ready to eat it it has defrosted. Otherwise, I don’t know how you’d get full use out of them unless you were feeding a large crowd on a single ride. You could cut the recipe down, too. Another thing that works for me is making the full amount of rice, making the rice cakes I need, and then using the leftover rice for other recipes, like Sweet Rice Porridge, etc. I freeze mine all the time after I cut them and wrap them. I put the wrapped cakes in a freezer bag. I pull one or two out the night before a ride & they are fine. I have never had a problem with the thawed cakes having a poor consistency or taste. They seem exactly like the freshly cooled rice cakes I’ve eaten. Wow! How long are they in the freezer? A few days? Longer? I freeze mine too. My baking pan will let me make a batch of 9 cakes at a time, which lasts me about two weeks, maybe a little longer. They taste fine to me after freezing them. I make a sweet version though (egg, raisins, stevia, honey or maple syrup), not sure if that makes a difference. I also take out a couple the night before a ride and let them thaw. They don’t taste quite as yummy as fresh out of the rice cooker, but work fine for me when I’m on my bike in the middle of nowhere. If I vacuum pack them – how long will they last for? Thanks for a great cookbook, can’t wait for the next one in the new year!